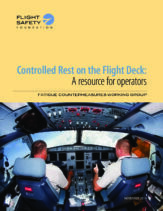 Controlled Rest on the Flight Deck: A Resource for Operators was developed by the Fatigue Countermeasures Working Group and was presented at the Flight Safety Foundation’s International Air Safety Summit in Seattle in November by Dr Alex Holmes from Clockwork Research and Brad Favors from Southwest Airlines. The Fatigue Countermeasures Working Group is comprised of fatigue safety managers from a number of commercial air transport operators, primarily located in the United States; labour representatives from multiple pilot unions; researchers and scientists including Dr Alexandra Holmes from Clockwork Research, the National Aeronautics and Space Administration (NASA) Ames Research Centre, Washington State University; and various independent fatigue and human performance research organisations. Alexandra Holmes says: “the document is the first of its kind and provides much needed information and guidance for operators to assist them to consider if they should implement a controlled rest procedure, and for those that already have a procedure, how to ensure that it is effective as it can be”.